European Turtle Doves , known sometimes as just Turtle Doves, are a species of dove native to much of Europe, parts of Asia and northern Africa. These small doves are migratory, breeding in the northern part of their range and moving south for the winter. Both sexes of Turtle Doves are brownish, with a black-and-white stripe patch on the side of the head. The wings are a warm brown color, speckled with black. They have black bills and a red rim around their eyes. Turtle Doves are often found in popular culture as a symbol of devoted love. 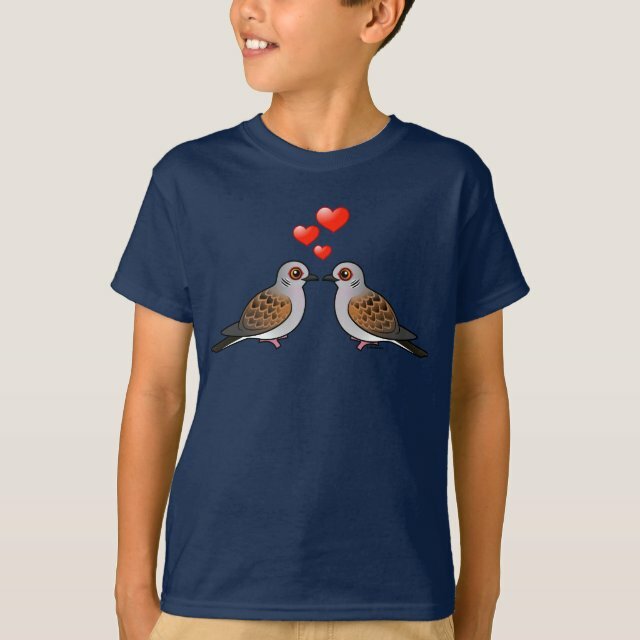 This original design from Birdorable features a pair of cute European Turtle Doves in love. You can totally customize this gift! Move the bird around, change the color or style, add your own text or images - make it your own!